So it was one of those mornings….I had a lot of work to do following up with the recent bill hearing and the little ones were bored and kind of driving me crazy. I knew it was time to refocus. We went to the kitchen and team-worked on making chicken soup. I had made some rich stock a few days ago and was planning on making chicken soup anyway and this was the perfect chance. I don’t use a recipe, actually… I use guidelines . My 5yo loves to chop carrots. He happily chopped carrots while we had a deep conversation. Him: “Dragons are real and the ice dragon can turn invisible.” He studies dragons a lot! 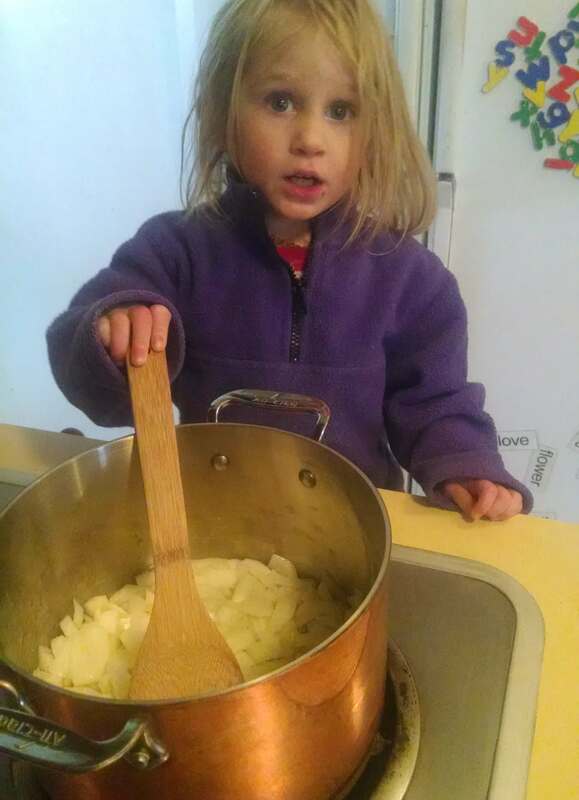 Meanwhile, my 2yo stirred the onions while they sautéed in the pan. (Thanks to a dear friend, I recently upgraded my pots and pans when she upgraded hers ). After a few minutes of dedicated chopping (and incessant talking like only a 5 yo can do) the carrots were all chopped up! I love that simple, easy guidelines and a little bit of practice offer my children fun opportunities in the kitchen and a time for us to reconnect, coming together over food! Sometimes it’s nice for me to have the reminder that THIS is what it’s all about: Nourishing their bodies with good food and their souls with the conversation, and action that comes from a deep conviction! When we are free to procure and eat nourishing food, we can pursue happiness in other areas of our lives! We had a great time in the kitchen together a SOUP-er lunch. What recipes do you make with your kids?